Before take-off, every pilot needs to brief their crew about what to expect. 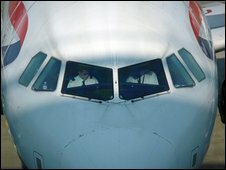 Pilots say this brief and debrief system has reduced errors and made flying safer, and a growing number of NHS medics think this system should be adapted - to make surgery safer. A report by researchers at the University of York claims that accidents, errors and mishaps in hospital affect as many as one in 10 in-patients - but that up to half of these were preventable. One doctor who has trialled the brief and debrief system in two units at his hospital says incidents were reduced by between 30-50% over the period they used it. Mr Peter McCulloch, a surgeon at Oxford's John Radcliffe Hospital, said his experience showed the system worked - but there was some resistance within the NHS. "Various people in various parts of the country are trying to introduce this kind of team training and Scotland are actually ahead of England in this. "But it runs crossways to our culture and training. "We are trained to believe that we know what is going on, take the major decisions and keep an eye on everything, which is impossible for any human being. "If you have been trained in this culture that instils in you that everything is your decision and responsibility, and it is very hard to stop and listen to your junior trainee who might tell you that you are doing something wrong." He said they had introduced the briefing technique in surgery to prevent recurrent strokes, where a blocked artery in the neck is cleared, and keyhole gall bladder surgery. "We have had episodes where we have done a briefing for a procedure that required a certain piece of equipment, and the theatre nurse has said 'Mr X has that so you can't'. "Without the briefing we might have found that out halfway through the operation and been really stuck, and we would have either had to open the patient up or delay. "I also know of cases for surgery to prevent strokes where the anaesthetist was just about to give the wrong drug, which would have been potentially fatal, but one of the team piped up and said not to do it. "Everybody must do team-work training in the air industry right from being a baby pilot in training - we are only at the start of that process in surgery, but I think it is an exciting prospect if we could get this built into the system." Trevor Dale, a retired airline pilot and trainer said: "For airline pilots team work is mandatory and has been for several years. "We must do what we call 'crew management resource training' and airline pilots can effectively terminate their career if they can't work effectively in a team. "There is quite a large movement in attempting to use this style of training message for healthcare. "In aviation before every take-off and every landing the crew, and sometimes the cabin crew, will discuss what to do if all goes well and how to deal with any unplanned emergencies that can conceivably go wrong. "They are trying to get everything sorted out in advance. "Operating theatre teams generally don't do that, so when they are faced with problems -which they almost inevitably are, making assumptions about what to do can be very dangerous." John Black president of the Royal College of Surgeons, said it is vital that the whole operating team work together. "The college takes best practice from many other industries and applies it to surgical training. Being a good team-leader is not just about what the surgeon does but about ensuring that the whole team works effectively."